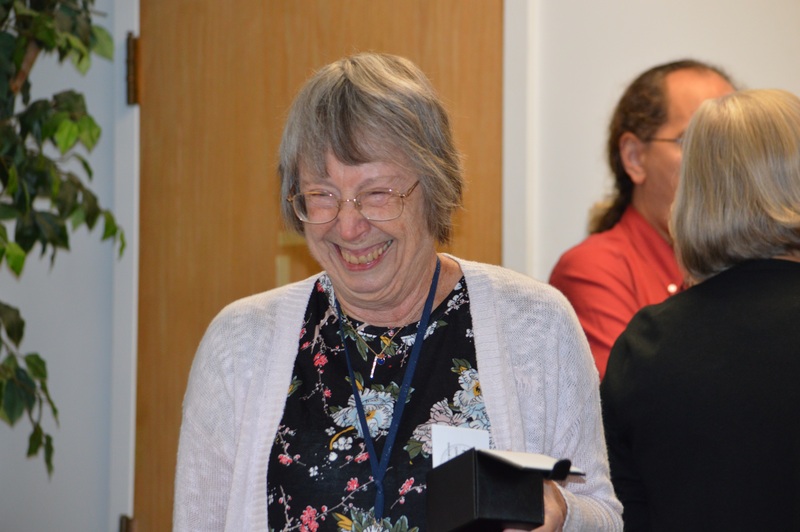 Alice Bampton, Communication & Marketing Program Manager, retires on September 1. Bampton grew up in western Maryland and graduated from Davis & Elkins College with a B.S. degree in Chemistry. She has a B.A. degree in Art History from Rosemont College and a M.A. degree in Art History from Temple University. After graduating from Davis & Elkins, Bampton worked as a chemist in a research lab at Norristown State Hospital. After the facility closed, she continued her career working for Pennwalt in King of Prussia, Pennsylvania. It was many years later that Bampton forged a new path, becoming involved with a volunteer art education program. “After my son was born, I volunteered for an art education program, ‘Art Goes to School,’ in my local school district,” she reminisces. “I really enjoyed working with older kids and decided I wanted to go back and learn more…I enrolled at Rosemont shortly after.” Upon completion of her degree at Temple, she began teaching at Rosemont, working as an adjunct professor in the Art History Department. In the fall of 1986, Bampton began teaching Art History at Villanova University after her friend and former colleague [then a current faculty member], suggested she come to Villanova. “Ancient Art” and “Beginnings to Renaissance” Bampton states, were the first courses she taught as an adjunct professor at Villanova. Recalling her favorite courses, she exclaims, “I enjoyed teaching Italian Renaissance because that’s my passion. I also liked the History of Photography because that’s fun.” Bampton developed the first History of Photography course offered at Villanova (which is still a course offering in the department). In August of 1998, Bampton became a fulltime Villanova employee working as a Slide Librarian in the Art History Department. After commenting about the conditions of the Slide Library [then located in the basement of SAC], the collection was moved to Falvey Memorial Library. Grateful for the move, Bampton was thrilled the film had found a proper home: “The basement of SAC was extremely humid, which was not good for the slides.” Eventually, the Slide Library became part of Falvey, as did Bampton. She continued her work until the Slide Library was phased out, after which she joined the Communication and Publications Team led by [then team leader] Judith Olsen. “Someone figured out that I understood commas and I swear that’s why they had me writing,” Bampton laughs. She remained on the Communication and Marketing Team [now lead by Joanne Quinn ’84 ‘15], a position she continued to hold until retirement. Throughout her years at Falvey, Bampton composed numerous articles and documented many milestones with her photographs. Some of her fondest memories at the Library were those she spent photographing Special Collections’ exhibits. “The most interesting exhibit was ‘Blood and Soul: The Russian Revolutions of 1917,’” she states, “that was so far away from things I know about…the memorial service for the victims of the Russian Revolutions in Corr Chapel was just fascinating.” [Bampton spent over two hours documenting all the artifacts displayed in the “Blood and Soul” exhibit]. Behind the camera, Bampton enjoyed meeting new people and attending engaging events. “During my time at Falvey, I was able to participate in a number of events that I wouldn’t have attended had it not been for the camera.” The Villanova Literary Festival and One Book Villanova were among her favorite events to photograph, as she enjoyed meeting the authors. Retirement will be busy, as Bampton has no plans to slow down. She will be traveling to Charleston, South Carolina, later this year to attend The Center for Civil War Photography Seminar. An avid traveler, Bampton would like to travel to Greece in the near future. Locally, she plans to spend time gardening, and starting this fall, she will be taking courses at the Pennsylvania Academy of Fine Arts. The Falvey community will miss Alice Bampton, though her contributions to the Library remain in her cheerful articles and captivating photographs.